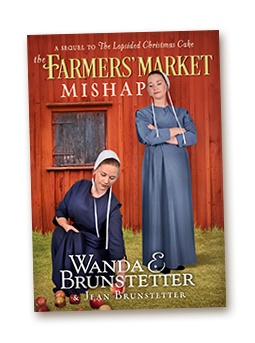 Return to Amish Country in Topeka, Indiana, and the Hochstetler twin sisters who are pulled apart by life’s changes. Elma is living alone for the first time in her life after Thelma married. Elma has dated some, but she wonders if she is just too picky to find love. Will she remain alone while Thelma moves on to build a family? Find out in this brand new romance from New York Times bestselling author Wanda E. Brunstetter, writing with her daughter-in-law Jean Brunstetter. Re-release of The Lopsided Christmas Cake in a trim-line version. Since my co-author, Jean and I both love Christmas, we decided to give our book a Christmas theme. The idea for twins came about because my mother, Thelma, and her sister, Elma, were identical twins. It was interesting to watch them over the years and observe their similarities and differences. When something happened to one of them, such as an illness, I could almost be sure it would happen to the other twin soon after. If one twin bought a new dress or pair of shoes, the other twin had to have one, too. In this story, which we named, The Lopsided Christmas Cake, there’s a message to be told, but the book also has a lot of humor in it. Since we know first-hand that humor can be good medicine, Jean and I wanted to share some fun times with our readers as they followed the story of the Hochstetler twins. I hope our readers will enjoy the story of Elma and Thelma and their adventures after acquiring a new home and business as much as we enjoyed writing it. 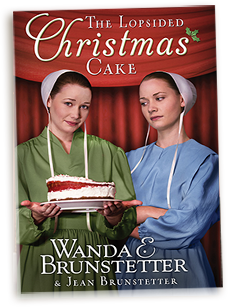 After receiving numerous sequel requests from people who had read The Lopsided Christmas Cake, Jean and I decided to write a second book about twins Elma and Thelma. Since we have Amish friends in Grabill, Indiana, it seemed only natural to include some scenes that would take place in that small town. It was fun to revisit the Hochstetler twins and continue with their story. Jean and I hope our readers will enjoy reading The Farmers' Market Mishap as much as we enjoyed writing it.